What is Thyro3 (Liothyronine Sodium) used for? Liothyronine Sodium is prescribed to treat people suffering from an underactive thyroid (hypothyroidism). Liothyronine Sodium is a synthetic version of a thyroid hormone that can replace the hormone that is naturally produced by the thyroid. Hypothyroidism can occur naturally, from injury to the thyroid gland, radiation or medication, or by surgical removal of the thyroid gland. 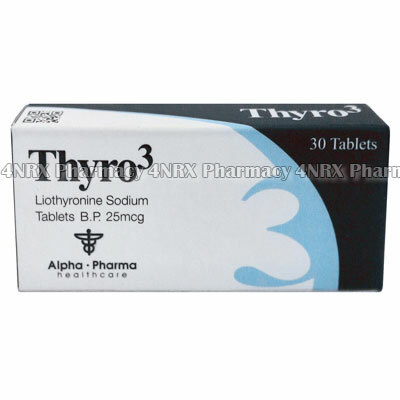 Liothyronine Sodium is also used to reduce thyroid function in certain cases such as goiters (enlarged thyroid glands) or Hashimoto`s thyroiditis. How should I use Thyro3 (Liothyronine Sodium)? A starting dosage for hypothyroidism is 25mcg for adults and 5mcg for children. Your doctor will schedule regular blood tests and adjust the dosage as necessary to achieve the required levels of thyroid hormone. For goiter or myxedema the starting dosage is usually 5mg and will be adjusted to a higher dosage as required. What are the side effects of Thyro3 (Liothyronine Sodium)? Liothyronine Sodium may cause nausea. In some causes, a small amount of temporary hair loss may occur when starting treatment with this drug (particularly in children). Sometimes it is possible to have too much thyroid hormone. Signs of this include headache, irritability, trouble sleeping, nervousness, increased sweating, heat intolerance, diarrhea, menstrual changes. Let your doctor know if you experience any of these. These rare, but serious side effects will require you to contact your doctor immediately: chest pain, trouble breathing with exercise, fast/irregular/pounding heartbeat, swelling of the arms/legs, extreme weakness. Seek immediate medical attention if you show any signs of allergic reaction such as rash, itching/swelling (especially of the face/tongue/throat), severe dizziness, trouble breathing. Tell your doctor of any allergies you may have before taking Liothyronine Sodium. It is important to tell your doctor of any other medicines you are taking. Too much, or too little thyroid hormone can drastically impact the rate at which medicines are metabolized and eliminated from the body.